The design and production of environmentally safe storage buildings has been an important segment of MakLoc, offering companies code compliant structures that protect people and nature. These have been developed to the strictest standards of chemical and fire safety to control materials like pesticides, petroleum, fertilizer and other products that are potentially volatile. Segmenting dangerous materials with secondary containment is an industry requirement, so we built economical solutions that are fast to produce with customizations based on need. Capacity, access, flooring and other safety features can be added to individual structures, optimizing them for oil and gas, agriculture, heavy industry or government. All of our buildings are constructed with non-combustible structural steel including the skid, and baked with polyurethane enamel. Heavy duty doors have panic hardware and non-removable pin hinges, protecting from unauthorized access. Various sizes are available for standard buildings ranging from 450 to 1410 cubic feet, with optional customization for specific needs. 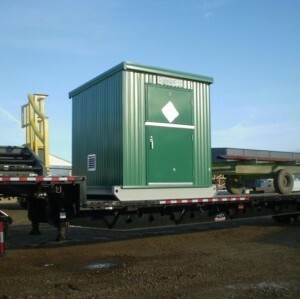 Our Chem-Loc buildings are manufactured at our Edmonton facility can be transported throughout Western Canada. MakLoc prides itself in offering custom products to our customers, adjusting the structure to best need specific industry requirements. Practically everything about the building itself can be altered, from colors and door sizes to explosion proofing and hoisting equipment. The goal is produce a functional structure that makes work easier and safer, so we have even implemented detection monitoring systems and safety items. With such a flexible and reliable platform, we have built and implemented our Chem-Loc buildings into many different industries. These rigid manufactured structures house petroleum products, hazardous chemicals, labs, explosives, agricultural products and industrial waste. By adding features such as shelving, ramps and utilities, these structures become functional work spaces as well, more than just a simple hazardous materials storage shed. The design and production of environmentally safe storage buildings has been an important segment of MakLoc, offering companies code compliant structures that protect people and nature.